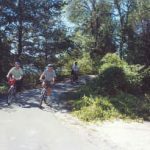 From the Little Traverse Wheelway, Petoskey’s newest amenity, the Bear River Valley Recreation Area can be accessed by crossing West Lake Street at the fire station/city hall complex. The park includes a 1.5 mile path along the beautiful Bear River. Walk, bike, cross-country ski or snowshoe. Pedestrian observation decks and restrooms are available in a few spots. This beautiful facility also includes a 1/4 mile long whitewater course – the only one of its kind in the lower peninsula. The paved trail runs from Sheridan Ave. to Lake Street. A non-paved trail continues south of Sheridan, follows the Bear River to Standish Avenue and Riverbend Park. This section of the trail is part of the North Country National Scenic Trail. The Downtown Greenway in Petoskey connects downtown with Bay View. View a map of the Greenway. The Anderson Road trail makes pedestrian and bike travel safer along Emmet County’s busiest stretch of road. The paved trail provides a pedestrian link from Petoskey to the busy Anderson Road shopping corridor. It links up with a city sidewalk near Anderson Road and U.S. 131 and runs as far south as Lears Road.